The project takes place in Craiova, a town in the south-west of Romania. Romania is passing through a very hard period because of the recent political and economic changes. But this country also has to face up one of the heaviest emergency of the last years: the orphans. In orphanages they are at least 110 thousand, more than 2 thousand are street children and they live in the manholes of the towns. A whole generation marked by privations and abandonment. Most of the children in this situation grows up in absolute poverty, vulnerable to any kind of abuse, without any chance to be part of the social system. Families leave their children in institutes because of poverty and because of the many cases of single parent who are not in condition to take care of their children. Many orphan children are mental or physical handicapped since no support is provided to the parents. Most orphanages lacks of staff and proper utilities and children come to suffer of the "hospitalization" syndrome: emotional and behavioural problems, psychomotor illness. The recent economical changes have not improved the families incomes but have increased disparity and poverty. The deterioration of life standards, inflation and unemployment had negative consequences on the population behaviour, on the family development and on children situation. Most of them suffers because of malnutrition but also because of educational lacks. Public schools have not enough teachers and didactical tools. Many children are not even able to purchase pens, books, notepads and so on. 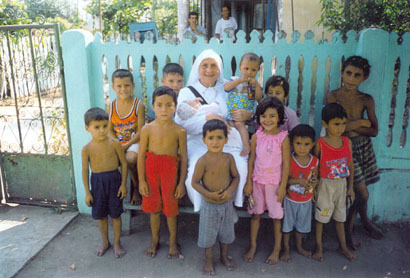 The project was proposed by sister Giorgina Schembri, missionary sister in Romania since 1992, from the religious order of San Vincenzo de Paoli. The project consists in the building of a school made of 9 classrooms in the city of Craiova with a double aims: to give to 150 poor and orphan children the chance to attend a basic scholastic training and to offer children a different place from the street where to study, to receive care and love. The children attending the school will also receive a hot meal during the day. 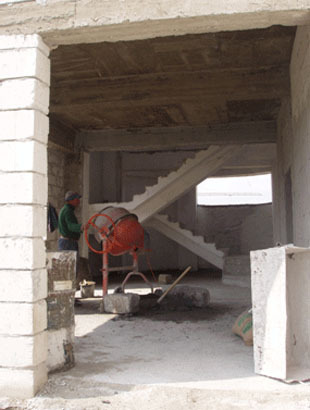 "Aiutare i bambini" and the Nando Peretti Foundation support the building of the school. 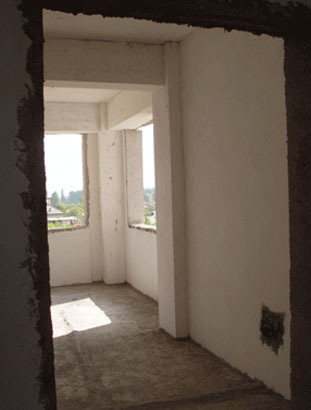 The project site was visited in May 2005 by Stefano Oltolini, responsible for all projects in Eastern Europe for the Fondazione Aiutare i bambini. I visited the project of the "Suore della Carità di San Vincenzo de Paoli" on Wednesday 11th and Thursday 12th May 2005, and met Sr. Giorgina (project coordinator and superior of the community) and her sisters. They live in Str. Deva, a central area of Craiova, a city with more than 350.000 inhabitants in the southern part of Romania. Since 1992 the sisters are working at the service of the poorest in town: elderly people, women abandoned, families in economic difficulties, poor children. Their house is made of a simple community area, a visitors room and a wide garage in which they store all humanitarian aids. Every day they have two pre-primary classes (kindergarten), legally recognized by the authorities . The two classes have a total of 48 children: 22 will attend the first level of the primary in 2006 and 26 will do the last year of the pre-primary. All children have been identified on the base of their difficult economic and familiar situation, and they come from different parts of the city. The kindergarten is completely free and the requests to attend it are much higher than the capability. Besides Romanian, special classes of English and Italian are tauught. The four teachers are paid by the Romanian State. All children are given a daily meal and the sisters are taking care of the didactic material and clothing when necessary. All children actually in the kindergarten will go in the "Casa Speranza" school once completed. In addition to the kindergarten, the sisters are helping around 350 poor families in town and 128 rom-children of the village of Birka, through a sponsorship programme. The support of the sisters goes into a better feeding, clothing, didactic material, humanitarian aid and some cash to the families. Other help comes from the Italian Red Cross and donations all over Italy. The overall project aims to build a Center (called "Casa Speranza") comprising a section for elderly people, a primary school and a little medical surgery. 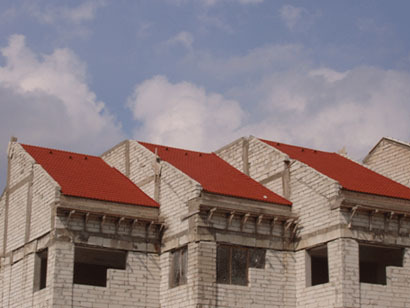 The structure has a central 3-storey building that will be used as a residence for the elderly people. The school built with the support of "Aiutare i bambini" and Nando Peretti Foundation is placed in the left wing. The school will have 150 students (8 classes with 20 students each and a room for the teachers), with 4 classrooms for the primary and 4 for the kindergarten. It will serve the poorest children of Craiova and it will be completely free. The Romanian State should be able to cover the cost for the teachers salaries and some of the on-going costs. The congregation will cover the remaining expenses. The central body of the construction (Centre for elderly people) is almost finished. Electricity and water are available, it only lacks the conclusion the provision of gas for cooking and heating. In order to save some resources, an artesian well has been sunk in the garden, and will serve the laundry. 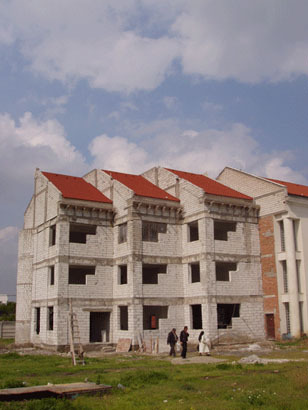 As concern the school, the project is close to completion. The roof has been completed, even if they're working in enlarging the gutters before winter. Windows will be assembled at the conclusion of the internal works, to prevent damages during fittings. Internal plastering is underway, and the external plastering will begin soon. Toilets are about to be finished. Light and water mains have been put in the walls. Unfortunately, both in 2004 and 2005 Craiova was heavily affected by storms and flooding that made impossible to respect the original timeline. If the weather will permit the conclusion of the works, the official inauguration of the school is expected in the beginning of 2006. The children in kindergarten will move in the new school.